but can sometimes be confusing to the developer. 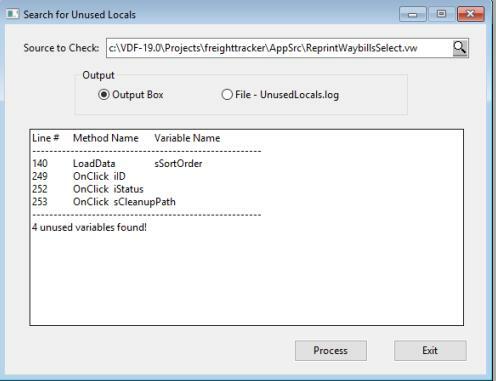 The goal of this program is to either show or output any unused variables to a log file. 3. Simply use the file dialog to find the source you want. Output will be to an edit object in the view or if file output is selected, then the log will be written to the directory where the source is being checked. is not because it's an evolving package and you should obtain the latest from vdf-Guidance. a comparison that requires an extra space somewhere. 2008-04-12 Fixed a few bugs, made it into a class so it is easier to incorporate in other apps and made a few minor adjustments. 2017-08-26 Added a "batch" function that will process all source files in an entire folder at one time. Added a help file & button. This project is under version control using subversion software.